Buy a Set of Koni Sport Springs for 2002-2006 Mini Cooper at ModBargains.com to get the Lowest Price Online. Our Modification Experts can answer any questions at 714-582-3330. Koni Sport Springs provide a slightly more aggressive and raked stance than your stock suspension while still maintaining a comfortable ride. They will also fit your Mini Cooper's stock shocks and are a great and affordable way to increase handling while giving your Mini a lower stance. On average Koni Sport Springs will lower your vehicle 1.0-1.5 inches, providing for a lower center of gravity and improved handling. Sport Springs feature more control than that of the OEM springs, but are still comfortable for daily use. Eibach Pro Springs are an excellent choice for street and occasional track use. 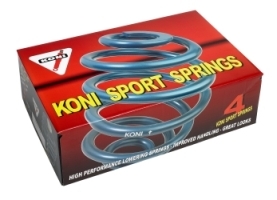 Aftermarket springs, like Koni Sport Springs, are commonly used to lower the ride height and to reduce body roll. This is also often done when upgrading to a larger wheel and tire package. Generally speaking, the stiffer the spring rates (the amount of resistance a spring is set for against compression), the softer the sway bar setting can be set in order to achieve a similarly flat cornering response.